Contact Us | Vantage Systems, Inc.
Our corporate headquarters is strategically located in the Aerospace Bldg in Lanham, Maryland, approximately 15 miles northeast of downtown Washington, DC and 1.4 miles East of NASA GSFC. Take Route 295 South (Baltimore-Washington Parkway) to 495/95 South (Capital Beltway). Take the GREENBELT/NASA GODDARD exit toward MD-193. Turn Left onto Greenbelt Rd. (MD-193 E). Continue on Greenbelt Rd. for approx 2.7 miles. Turn Left at Forbes Blvd. Aerospace Bldg will be on your left. 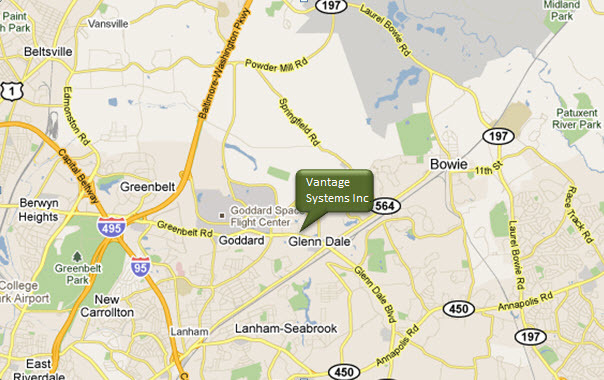 Vantage Systems, Inc. is located on the Fourth floor of the Aerospace Bldg., Suite 400. Take Dulles Access Road to 495 North (Capital Beltway). Travel across American Legion Bridge. Take the GREENBELT/NASA GODDARD exit. Turn Left on Greenbelt Rd. and travel approx 2.7 miles. Turn Left at Forbes Blvd. Take Route 1 South for 4 miles. Take 95 East toward Baltimore. Cross Woodrow Wilson Bridge and follow 95. Continue east approx 1.4 miles. Turn Left at Forbes Blvd.